I mistakenly took Squawk Box off mute this morning. It was just in time to hear one of the regular anchors—–the one who makes Joe Kernen sound slightly insightful by comparison——forecast a pick-up in global growth on the grounds that “China is recovering”. And that incendiary deposit of more unpayable debt, which came on top of the $30 trillion already smothering history’s greatest construction site and open air gambling den, did indeed goose China’s real estate prices, state company CapEx, infrastructure building and steel production. Call it fiat growth because even pyramid building adds to stated GDP, at first. Nor are the red suzerains of Beijing unique in the headlong dash toward the financial cliff. Except for the nicety that Japan’s 30-year and 40-year bonds are trading at a microscopic fraction this side of zero (0.3%), Kuroda and his tiny band of mad men at the BOJ have driven the entirety of Japan’s monumental public debt——which is now actually measured in the quadrillions of yen—–into the netherworld of negative yield. The same can be said for the ECB’s $90 billion per month bond buying bacchanalia. Having made German bunds so scarce as to have eviscerated any semblance of yield and turned Italy’s sovereign junk into super-bluechips, the ECB will soon be slurping up the corporate bonds of any global company that can fog a BBB credit breathalyzer and plant an SPV within the borders of the EU-19. The hopeful CNBC anchor-lady didn’t say. And about what happens if he isn’t stopped, she didn’t say, either. The FOMC’s expected stand pat posture at next week’s Fed meeting is just another proof. It was actually 36 months ago that Bernanke triggered the first taper-tantrum when he mused out loud about normalizing interest rates. In the span of time since and as of month 82 of this so-called business expansion, they have come up with exactly 25 bips off the zero bound. That is, the Eccles Building is petrified and sliding by the seat of its collective pants from one week to the next. Stated differently, if someone among the 100 or so central bankers and apparatchiks who rule the financial world knew how to “normalize” and had the will to try, it would have been evident long ago. What they have done, instead, is simply to soldier on toward the financial cliff ahead, thereby absolutely disabling and falsifying the pricing mechanism throughout the global financial system. And that’s because massive central bank intrusion in financial markets causes everything to be mispriced. Everything! 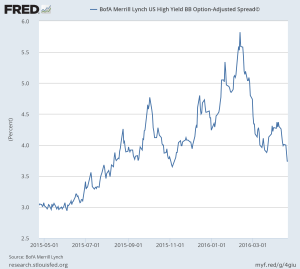 The stunning irrationality extant in the junk bond market, for example, is usually glossed over with a reference to the quest for yield. But this isn’t some kind of clinical phenomena—a passing phase of the credit cycle which will somehow correct itself. To the contrary. For example, this week underwriters sold $16.5 billion of Argentine sovereign debt from an order book that was over-subscribed to the tune of roughly $50 billion; and priced it at a yield (7%) once reserved for German bunds. Yet has the world’s greatest deadbeat nation and serial defaulter suddenly, magically rehabilitated itself, and even before its last financial scofflaw regime was even properly buried? The same can be said for most other sectors, and especially the stock market. You can’t capitalize a “hard landing” at 24.2X corporate earnings——that is, inflated profits which are already sinking fast. What you can expect sooner or later is a re-visitation of the post-crisis lows. What underlies the market’s current fantastic over-valuation besides sheer central bank enabled speculation, therefore, is the seemingly pragmatic notion that this is all just a slow-slog and that with enough time and patience—-and allowing for the “extraordinary” hangover of damage from the Great Financial Crisis—–economies will recover, financial systems will heal and the world will get back into its old groove. That’s more or less what anchor-lady was conjuring this morning. It’s not going to happen. In fact, the “old groove” was part and parcel of the hard landing ahead. There never was an honest and sustainable global boom during the last 25 years when Wall Street peddled the myth of the BRICs miracle and the notion that a flat earth and new world economic order were teeming with capitalist exuberance and breakaway eruptions of prosperity. The world is now $185 trillion of debt downstream from the mid-1990s starting point. 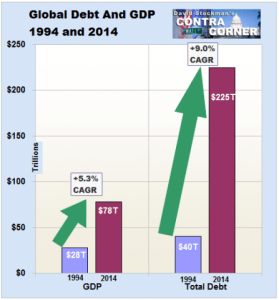 The $50 trillion of incremental GDP booked during that fantastic eruption of debt was far more borrowed than earned. That is, it was stolen from the future by means of the age old expedient of hocking tomorrow’s income for cash today. Alas, the future is arriving because global growth is grinding to a halt. 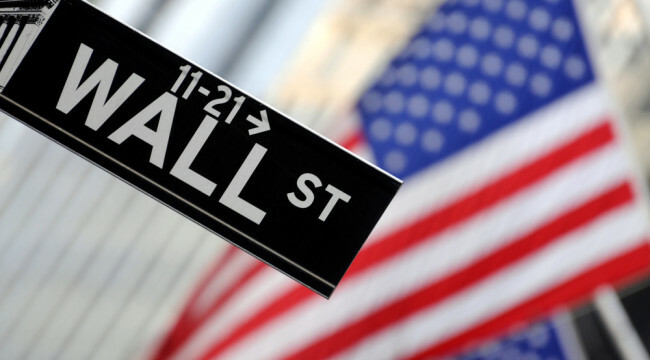 Now comes the payback time, but don’t tell Wall Street’s lemmings.